Bantayan Island is known to have some of the best beaches in Cebu. You can find white sand beaches here complete with crystal clear waters that are perfect for vacations and beach holidays. Though it is located in the Province of Cebu, getting to Bantayan Island is a bit tricky or is a little hassle especially if you are from Manila or coming from a different province. The reason for this is the long travel time to get there. It takes more than 4 hours of travel time to get to Bantayan Island from Cebu City, this excludes waiting time for your bus and boat to leave the terminal or pier . Travel time is composed of 3 or more hours for the bus ride from Cebu City to Hagnaya Port and about an hour of ferry ride from Hagnaya to the town of Sta. Fe in Bantayan Island. But once you reached Bantayan Island, bet you’ll say this. “ It’s all worth it my friend!!!”. How to go to Bantayan Island from Cebu City? If you want to go to Bantayan, the affordable way, then it is best to ride a bus coming from the Cebu City North Bus Terminal bound for Hagnaya Port. Please see the signboards of buses parked in this terminal for you might mistaken Bantayan Island for Daanbantayan, also a town in northern Cebu. Buses bound for Daanbantayan won’t be going to Hagnaya Port, so better be careful and ride only buses bound for Hagnaya. Hagnaya Port is located in the town of San Remegio. There are different bus companies like Ceres Bus Lines that ply this route. These buses offers ordinary (non air-conditioned) and air-conditioned buses for their passengers. Hagnaya Port is around 110 kilometers away from Cebu City. Bus fare is 150 pesos per person in an air-conditioned bus. Price difference between ordinary and air-conditioned bus is just 10 to 15 pesos so better ride an air-conditioned bus for it is more comfortable, plus you might got lucky to ride one with free wi-fi. During our trip, we got lucky to ride a 5:30 AM air-conditioned bus that offers free wi-fi and plays movies along the way. The bus driver drives a bit slowly and it took us more than 3 hours and 15 minutes to reach our destination. We arrived at Hagnaya Port at around 8:45 AM. The bus will drop you exactly at the front of Hagnaya Port. This is where you will ride a boat or ferry that will take you to Sta. Fe town in Bantayan Island. Boats leave Hagnaya Port at an hourly interval. Two shipping lines operates here daily, Island Shipping Corporation and Super Shuttle Ferry. They offer non air-conditioned rides for 170 pesos per person. Upon arrival at Hagnaya Port at around 8:45 AM, we immediately bought our tickets for an Island Shipping boat set to leave at 9:30 AM. After getting our tickets, we wrote our names at the Coast Guard’s manifest and payed our Hagnaya Port terminal fee at 10 pesos per person. We’ve arrived in the port of Sta. Fe at 10:30 AM. The ferry ride took just an hour thanks to good weather and calm seas. Upon arrival at the Sta. Fe Port in Bantayan, porters, tricycle, habal-habal and pedicab drivers will surely swarm you and will offer their services to take you to your hotel or beach resort. Most popular beach resorts in Sta Fe like Budyong, Kota Beach and Marlin Beach resort are just near the port. For first timers in the island, it is ok to ride a padyak or pedicab to bring you to your hotel. This will cost you 20 pesos per person. Avoid drivers that overcharge tourists. One way to avoid this is to ask locals (preferably store owners or carinderia owners) for directions or make arrangements for your hotel to pick you up for free. You will pay the same amount for bus tickets, boat fare and terminal fees on your way back from Sta. Fe to Cebu City. 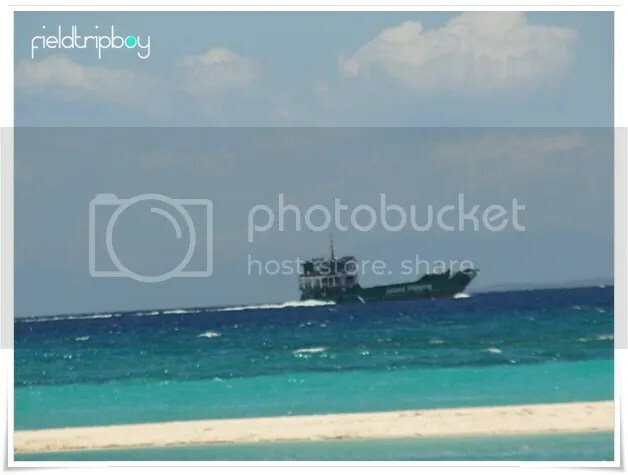 Visit Field Trip Boy soon as we will feature Budyong Beach Resort, Island Hopping in Bantayan, Sto Nino Cave, Danggit and Buwad Market and other exciting places in Bantayan Island. Please Like Field Trip Boy on Facebook and Follow me on Twitter!!! Pa Like and SHARE po… salamat!! !